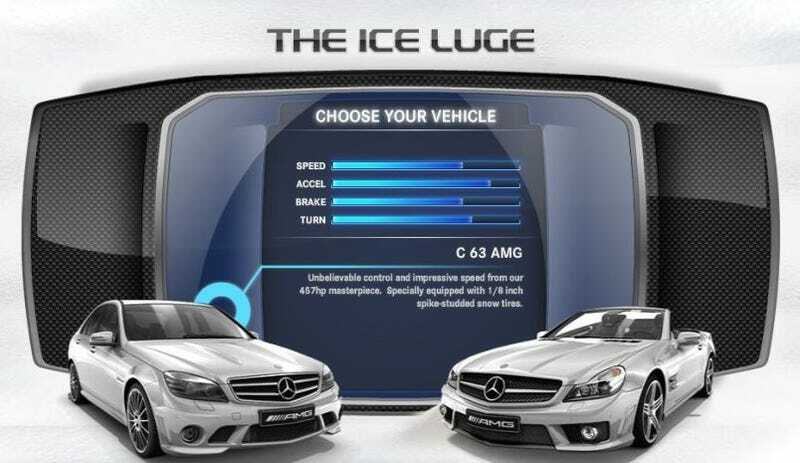 Have you ever thought about buying an AMG, but needed to know how it does in the ice luge? Now you can act out those urges with AMG's newest flash game! To fit in with the hip "Everyone's a Winner" trend sweeping through school gym classes everywhere, Mercedes has released a free online flash game that you can't lose. When we first heard about a game where you're bombing down an ice luge track in AMG products, the first image that popped into our collective heads was one of a silver Nazimobile doing gnarly flips after it flies off of the edge into oblivion. When approaching the edge, a mysterious red blur bumps you back on track. The bloody smear is a bit like getting shot in the face in Goldeneye. Although the never-lose system is kind of a buzzkill, it's worth wasting five minutes at work on such a widget. You can catch the fun here.